If you like gardening, the doldrums of winter can be dreary indeed. Although I’d never admit to it, my neighbors might swear to having seen me outside strangely (pathetically) counting the number of branches on my icicle-laden roses and rhododendrons. In any case, I do admit to spending way too much time forlornly staring at my garden from the window while fantasizing about all the things I’ll plant come springtime. Each new branch brings a new burst of color and fragrance and concomitant joy. A good thing right ? 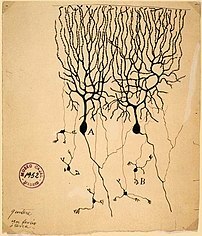 Similarly, each neuron in the brain – which look just like little trees with branches – should also strive to send out as many new branches and make new synaptic connections. Afterall, there are brain disorders associated with a loss of or fewer dendrites, such as Down’s syndrome and schizophrenia. More branches, more synapses, more brain power and concomitant joy ? Well, perhaps not quite. A gene known as seizure-related gene 6 (sez6) which is expressed in the developing brain as well as in response to environmental stimulation, seems to play a role in limiting the the number of branches that a neuron can send out. Gunnersen and colleagues [doi: 10.1016/j.neuron.2007.09.018] show that mice that carry an inactivated version of sez6 show more dendritic branches (implying that the normal function of the active gene is to inhibit branch formation), and that this is definitely not a good thing. These sez6(-/-) mice, while looking rather indistinguishable from their normal littermates, did not perform as well on tasks involving motor control, memory and emotional sensitivity (implying that having too many branches may not be so beneficial). In humans, a frameshift mutation involving an insertion of a C residue at position 1435 of the cDNA is associated with febrile seizures, similarly suggesting that dendritic overload can have negative effects on human brain function. Clearly, the human brain seeks a balance between too many and too few dendritic branches. I suppose most experienced gardeners would also agree that too many branches is not desirable. Perhaps they are right. However, I don’t think I’d mind much if plants came with an analogous sez6 mutation !